Reading the work of nineteenth-century doctors, it is striking that many tried their hand at fiction as well as penning medical articles and books. Surgeon William Gilbert, for example, published a number of novels that drew upon his medical experiences, including Shirley Hall Asylum (1863), which related the stories of patients in a private asylum. A series of articles in the New Monthly Magazine and Humorist, ‘Reminiscences of a Medical Student’, published between 1841 and 1844, affords another interesting example. ‘Reminiscences’ was written by Robert Douglas, a young Scottish naval surgeon, with each instalment of the series offering a self-contained story (occasionally these stretched across two pieces). Douglas died at just 24, but left behind an impressive body of writing. 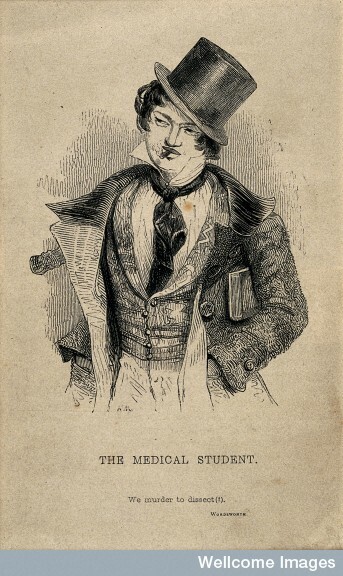 His pieces for the New Monthly Magazine were collected into one volume, The Adventures of a Medical Student (presumably ‘Adventures’ were more marketable than simple ‘Reminiscences’), after his death. Although fictional, Douglas’s series offers tantalising glimpses into the nineteenth-century medical student’s world: the horror upon first observing an amputation (‘The Widow’s Child’); the array of macabre equipment carted about in students’ pockets, from lancet-cases to ‘the bones of a hand of a skeleton, wrapped up in a piece of brown paper’ (‘The Adventures of a Night’); and the inevitable pranks of the profession (‘An Excursion with Bob Whyte’). Heaven keep me from ever beholding such a sight again! Its neck was thrust forward, its long gray hair stood on end, its brow was contorted into innumerable wrinkles, the eyelids were drawn forcibly back, the eyeballs with their dead glazed pupils protruding in a hideous stare, its nostrils were widely dilated, while a horrible greenish foam oozed out at the corners of its working lips. I could not remove my eyes from it for one fraction of a second. Never, before or since, has my whole soul been absorbed by such a feeling of unutterable horror! In this tale and several others, Douglas seems to betray both a fascination and uneasiness with the medical profession, dwelling on the ‘horrible’ and ‘ghastly’ details of dissection, amputation, and trepanation. As a reviewer of Adventures of a Medical Student noted in 1848, ‘the surgeon’s saw, poison, and other melo-dramatic climaxes of the same character, are brought forth in gigantic capitals’. His pieces were not mere sensation fiction, however, often containing a clear moral for the reader. ‘[U]nder the cloak of telling wonderful stories,’ the reviewer went on, ‘the author shielded a heart and head alive to the most profound and interesting principles of our nature’. 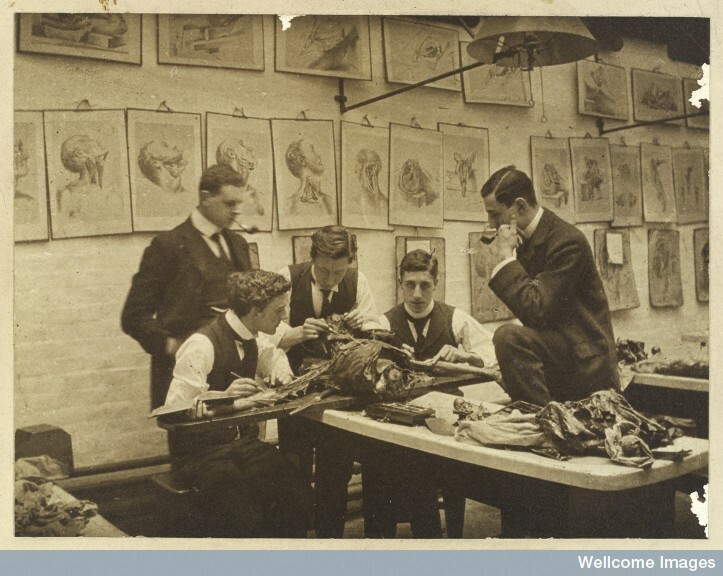 Certainly Douglas’s accounts of the operating theatre, though often wallowing in the gory details, were also thoughtful, expressing profound sympathy with the (albeit fictional) patients on the table and – in one case – their helpless watching relatives. Douglas’s ‘reminiscences’ offer an intriguing portrait of the medical student that goes some way to balancing out their questionable reputation in the eyes of contemporaries: not simply callous pranksters too much given to drinking (though he does admit that that forms some part of the experience), but individuals keenly aware of the gravity of the path they had chosen in life.